Was there ever a state visit more deserving of a post simply focusing on the gala dinner? No there wasn't. 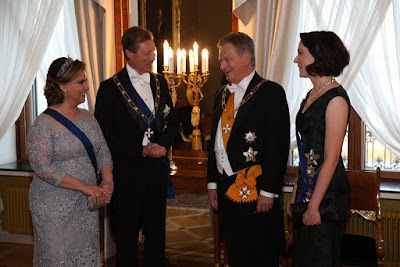 This one to Finland just turned out to be one of the best kind state visits: For this evening's gala dinner hosted by the Finnish President and his wife in honour of their guests from Luxembourg, Grand Duchess Maria Teresa didn't only get out the Diamond Vine Leaves Tiara (#love) but also a gown by Elie Saab. Grand Duke Henri also looked his dapper self in white tie and the Order of the White Rose of Finland. Can't wait to see more pictures! That was quick: Wort has more pictures of the gala dinner!